If I were to have a relationship with any food on the planet, it would be garlic. It is my one and true love, and I've known it to be ever since I could remember. I've always loved it - love at first taste if you will. When I was younger (say adolescent, mid-teenish), I used to just simply fry up smashed garlic in some salt and pepper and eat it. Alone. I know, I'm weird, but that's how much I love the stuff. When a recipe calls for 1 clove of garlic, I scoff, and triple (possibly quadruple) the amount. I've been working my way along making mezze appetizers (see here), since I can't get enough of the stuff and what better than to combine two of my obsessions: garlic and mezze. Together, their love child is the simply irresistible roasted garlic hummus. 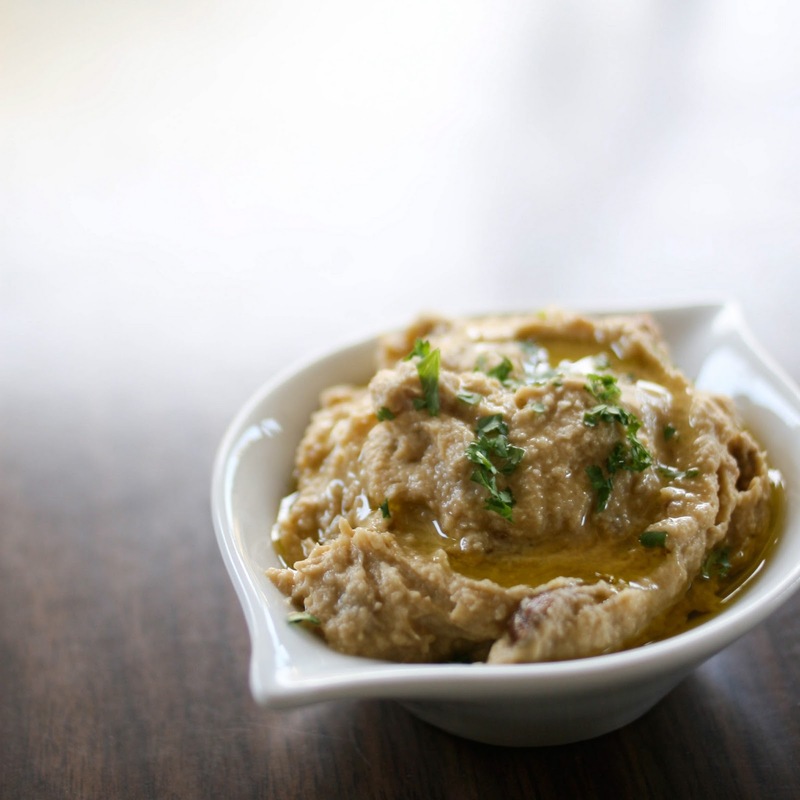 I have a hummus recipe I adore that's simple, easy to whip up and delicious. I just tweeked it a bit by adding loads of roasted garlic and I was in heaven. 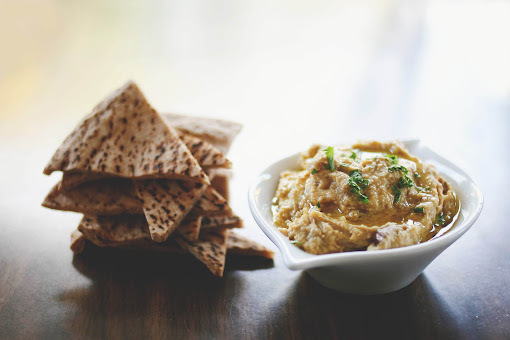 With warm pita bread or in a sandwich, it is purely awesome! Plus, it's healthy and lasts for weeks! 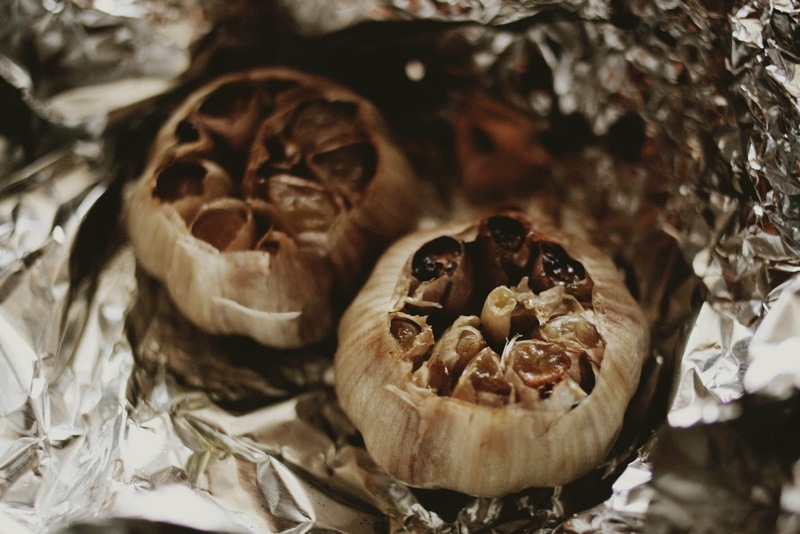 Preheat the oven to 400 F. To roast the garlic, peel off the outer layer of the garlic bulb, leaving the skins of the individual cloves intact. Using a sharp knife, cut off 1/4" of the tops of the garlic bulbs, exposing the individual cloves inside. Place the heads in a large piece of foil, then drizzle with about 1 tbsn. of olive oil. Fold and roast for 30 - 45 minutes or until the cloves are soft. Allow the garlic to cool until you can handle it. Once cool, use either a fork to fish out the garlic cloves or you can squeeze them out of their skins; set aside. Mince the fresh garlic in a food processor. Add the garbanzo beans, lemon juice and roasted garlic, blend until creamy, scraping the sides of the bowl occasionally. Blend in the tahini, cumin, and salt. With the machine running, stream in the olive oil and blend until creamy and combined. Add in the jalapenos and cilantro, blend until well minced and combined. Serve and enjoy! yum! 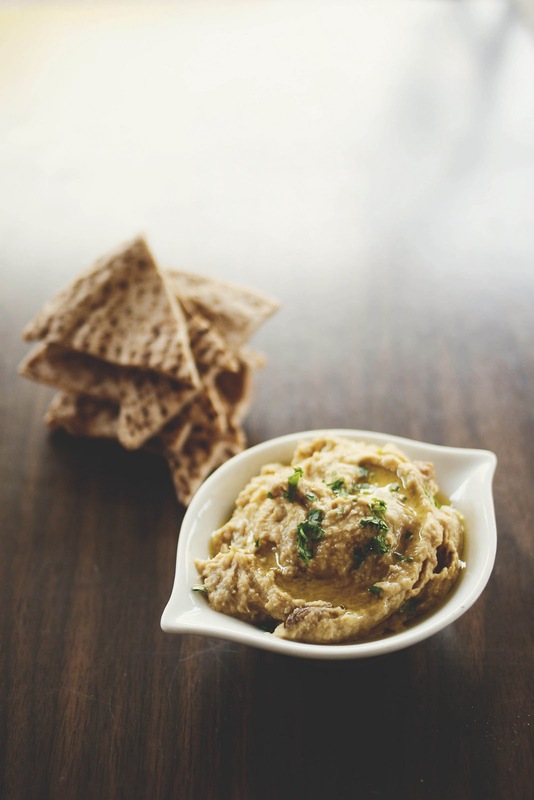 roasted garlic hummus is my favorite. i will only eat this kind, actually. :-) so good! OH MY. this one looks amazing. yuuuum! Is your "see here" link missing? 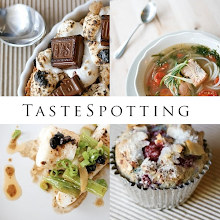 Your recipe looks amazing and I can imagine it being very flavorful. Woah, woah, woah. That looks like the most promising hummus recipe I've ever seen. I too LOVE garlic. My friend and I have a little tradition of roasting garlic and smearing cloves of it straight onto fresh bread while we watch Arrested Development. Good times. It must smell delicious when you're making it! your photography is incredible! i just came across your site, but i already know i'll be a repeat visitor. 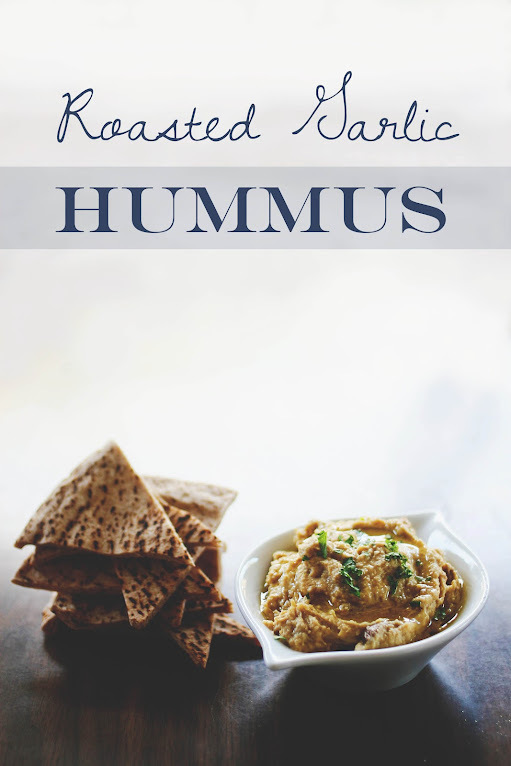 I just love hummus but have never made it myself...so thanks for this recipe! It will be well used! I love hummus, I'm completely addicted to it! And what a wonderful idea to add roasted garlic to it. Yum! This sounds lovely. 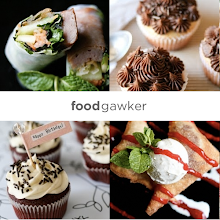 I'm going to make a stash today after work so it can accompany me through my week-end snacks! Thank you. Yum! You photographed it beautifully too!!! Just made this little gem! It's my new favorite hummus recipe. I love the cumin. I just made this and although it has a lovely citrus flavour, I find it to be too mellow in the roasted garlic department. Maybe I should have used Elephant Garlic instead of the regular heads, but I have another two heads roasting in which I am going to add another head and see where that gets me. I will then just use the extra sliced and left on as garnish so that people know what they are eating. Thank you otherwise for a lovely recipe.